IT HAS ARRIVED!!! The Counting Songs CD is now available!!! Have Fun Teaching has just released their second teaching cd called, "Counting Songs." 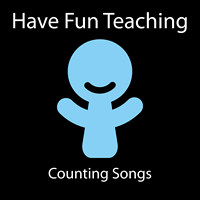 The Counting Songs CD from Have Fun Teaching is the perfect way to teach your kids how to count. Each song is filled with fun beats and dance moves that will get your kids out of their seat and counting with the beat. These math counting songs are great for learning multiplication facts and skip counting. With this CD, kids will learn how to skip count by one all the way to counting by twelves. The last track then practices counting down from twenty to one. There is something for every age level with this CD. Young kids will love the Counting By Ones, Counting By Twos, Counting By Fives, Counting By Tens, and the Counting Down From Twenty Songs. Older kids will enjoy the entire CD as they dance and sing while they learn.